If you think the glasses you have to wear at every 3D movie today are a pain, remember to be grateful that we're not all stuck with the early 20th century's version. 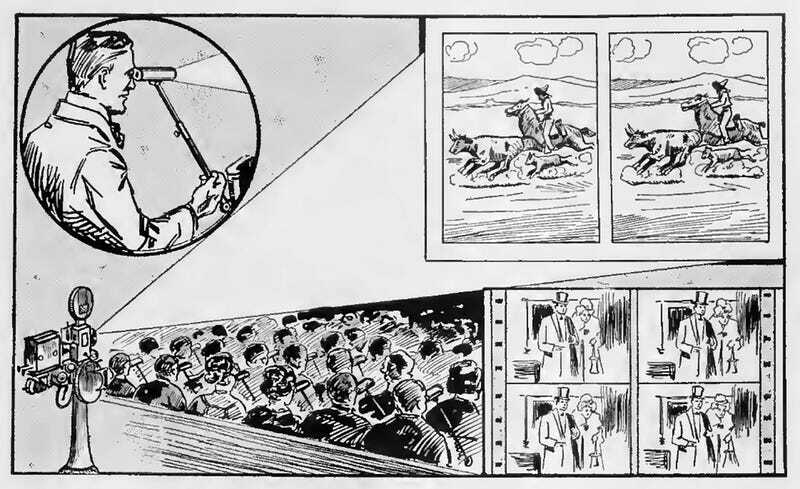 Back in the 1910s, many people were experimenting with next-big-thing technologies for motion pictures. Much of the promise was in developing synchronized sound, a technology that wouldn't come into common use until the end of the 1920s. But some prognosticators at the dawn of the Roaring Twenties imagined that 3D must be the wave of tomorrow. Albeit, 3D with a decidedly Victorian flair. Yesterday's 3D glasses of the future had to be held up to your face by a cumbersome telescoping arm (something akin to opera glasses) and used stereoscopic tech that had become a popular amusement utilized in still photos in the 19th century. Feature movies — still a relatively new undertaking in 1919 — were destined for the delights of 3D, according to Electrical Experimenter magazine. The accompanying illustration shows a possible later-day development of the present moving picture, which, altho it has been greatly perfected in the past few years, leaves considerable detail yet to be worked out. No matter how clear or flickerless a motion picture may be when viewed on the screen as projected by modern moving picture machines, it would still be one hundred per cent more perfect to our vision, if it could be thrown on the screen in duplicate then undoubtedly it will be necessary for the theater proprietor to provide or make readily accessible, by means of slot machines arranged on the back of the theater chairs, etc., a special small size stereoscope similar in appearance to a pair of opera glasses, thru which the duplicate moving images on the screen could be properly viewed and focust. These would of course be fitted with proper lenses for the purpose. It might seem off-hand that this latter refinement would be unnecessary, but it is really one of the great marvels of science that causes us to see the images stand out, as it were, from the picture, when we look thru a stereoscope at the photographs or other views mounted in duplicate. The stereoscope operates on a very simple and yet peculiar physiological arrangement, based on the inter-action of the optical powers of the two eyes when they are focust on two properly made and similar images. The magazine assured readers that this new "movie" invention (yes, they put the word in quotes) was just over the horizon, ready to invade a theater near you. And while we thankfully don't need to hold our glasses to our heads any longer, their prediction (for better or worse) was absolutely correct.